Baybayin Modern Fonts: Galit sa kulit. Learning the Kapampangan style of baybayin. Súlat Kapampángan (a.k.a. pámagkulit, kulitan) has been kept alive by loyal practitioners, but for a long time it was only limited to the elite few - the scholars, intellectuals, and advocates. It is currently on a sort of revival with local youths, thanks to recent publications, several active organizations in universities in the Philippines, local artists, and the Internet. However, the Doctrina Christiana based Tagalog (sans-virama) and Ilocano (w/ virama) versions of baybayin are more prevalent with Filipinos outside of the Philippines. This is due to the proliferation of sites that are a dedicated to "traditional" baybayin in that style, not to mention a larger population of Tagalog/Ilocano speakers and their third-generation (Fil-Am, Fil-Canadian, etc.) children who are rabidly searching for their roots and holding on to heritage. To render an "e", write the character (not the kudlit) for "I" next to the consonant. To render an "o", write the character (not the kudlit) for "U" next to the consonant. To lengthen the "a" sound, write the character for "A" next to the consonant. To lengthen the "e" sound, write the character (not the kudlit) for "I" next to the consonant that already has an "i" kudlit. To lengthen the "u" sound, write the character (not the kudlit) for "U" next to the consonant that already has an "u" kudlit. These methods work particularly well with the Kapampangan language since their "o" and "e" vowels are conversions of diphthongs to monophthongs, but it may be cumbersome if not confusing to other Filipinos who are mainly used to Tagalog, particularly the Filipinos born outside of the Philippines whose proficiency with other Filipino language is mediocre at best, let alone having an ear for the accents of native languages. 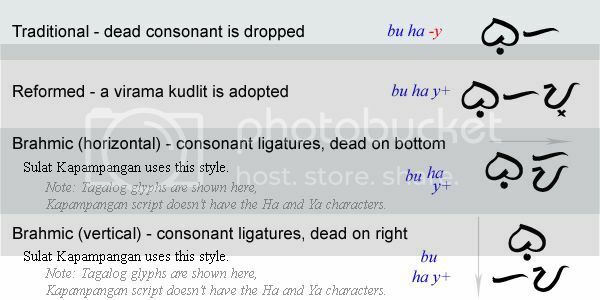 The Kapampangan language does not use the "H" sound except in loan words, naturally Súlat Kapampángan does not have a glyph for "Ha". It also doesn't have characters for the "W" and "Y" sounds, instead the glyph for "U" represents the "W" sound and the glyph for "I" is used for the "Y" sound. Furthermore, "Wa" is rendered by combining the "U" & "A" characters, while "Ya" is rendered by the combination of "I" and "A" characters. Also, to render a standalone "E", ligatured glyphs "A" & "I" are used; and to get a standalone "O", use the combination of "A" & "U" glyphs. Forming consonant conjuncts by creating compound character ligatures is a method where trailing consonants (consonants without vowel sounds at the end of a syllable) can be written without using a virama (vowel cancellation mark) in order to render dead consonants in Súlat Kapampángan. Just like the virama, this method is adopted from other Brahmic scripts, and this method is also observed and recorded on the oldest artifact that bears Kawi (Old Javanese) and a proto-baybayin form of writing; the Laguna Copperplate Inscription (LCI). When writing horizontally (an alternative way), to remove the default vowel from a consonantal character, its glyph is stacked under its preceding "main" syllable character. When writing vertically (preferred and considered traditional), to remove the default vowel from a consonantal character, its glyph is placed at the right of its preceding "main" syllable character. The Kapampangan method can be quite beautiful when used for typographic arts such as logos, tribal tattoos, calligraphy, etc. And if you're opposed to using the Spanish addition of a cross kudlit or any form of virama mark but still want to render trailing consonants (leading consonants is another story), then feel free to use the Kapampangan version of baybayin. While the Kapampangan method has its advantages with a wider range of vowels and its ability to render trailing consonants, it is perfect for writing the Kapampangan language. However, it has its limitations when it comes to standardization or modern typeface design and word processing as well as rendering non-Kapampangan or foreign loan words. Legibility is often compromised when writing vertically, since stacking a character with a kudlit over another tends to confuse readers as to which glyph the kudlit belongs to, especially when spacing between characters are too close. Súlat Kapampángan characters' evolution appeared to have diverted from other baybayin scripts through time since the 17th century. A 1699 publication, "El Arte de lengua Pampanga" by Alvaro de Benavente shows Kapampangan characters that are still very similar to the Ilocano script characters recorded in the 1620 Doctrina Cristiana with only slight variations on a couple of characters. Benavente's script also bears much resemble to the current living Tagbanua script from Palawan. Comparison of Benavente's script to the scripts recorded in recent publications from the 1960's up to 2008 by the likes of Zoilo Hilario, Mariano Henson, and Michael Pangilinan, et al. shows how cataloging handwriting changed the glyphs dramatically. And it is not just stylistic changes but the basic form of several Kapampangan characters have totally deviated from the Tagalog/Ilocano versions of baybayin. Couple these changes with the unique (vertical - top to bottom direction) method of writing, Súlat Kapampángan is in a class of its own. Another Philippine script that evolved similarly is Bikol's Basahan script (that's another story). Emulating the Kapampangan writing method using "traditional" Tagalog/Ilocano baybayin characters could be a sensitive issue. On one hand we do not want to offend regional sensibilities, on the other hand imitation is the purest form of flattery. We should be proud and thankful that Kapampangans kept their script alive as did the Mangyans of Mindoro and the Tagbanua of Palawan. Indeed we need to look back to our pre-Hispanic austronesian and Brahmic origins as well as the preserved manuscripts from colonial times in order to understand our lingustic roots, but we also need to look at the current living scripts in order to find ways to save traditional baybayin. It may be idealistic to want to have a standardized script to represent all Filipinos, but we need to consider all things at hand and take careful steps to keep baybayin going for future generations. Thanks! You presented my paper better than I did. I appreciate it. Thanks again! I like your idea of composing Baybayin in the "Brahmic" or "Kapangpangan" style. It gives a different feel for Baybayin without fundamentally changing the script itself... and without negating the traditional "linear" style. Last night, I realized it might be interesting to create a "half-sized" font, where the lowercase letters render as Baybayin on the top "half" of the character space, and uppercase letters render, like kudlits, as Baybayin on the bottom "half" of the character space. This could allow computer rendering of a Brahmic style, don't you think? That's interesting the way Kampapangan handles final consonants, although I wouldn't necessarily consider that Brahmic, since as far as I know from reading about various Indian writing systems, a subscript consonant represents a consonant plus full syllable. So ba under ma would come out as "mba", not "mab". All of the Brahmic systems I've read about use the virama to indicate final consonants. I feel that for Baybayin, the simplest solution would be to use a virama for both consonant clusters and final consonants. It may not make the script as intricate, but it makes things simpler, and Malayalam went through this process due to the difficulties of conjuncts in printing the language as I understand (although use is inconsistent and not all conjuncts were disposed of). As for the vowels, I'm more of a fan of elaborating on the simpler method for marking the kudlit in the other Philippine scripts than the Kampapangan style. I'm thinking of variations of the original marks. I would not advise going with a typically Indian method of creating the vowel marks. For example, the "e" diacritic before a glyph with the "long a" diacritic after it in order to render "o" as in Tamil. Javanese does a similar method. So, a dot above could render i, while a slash above the glyph could render e. A dot below could render u, while a slash could render o. There's no doubt that Kampapangan is a wonderful script esthetically as well as for calligraphic works, but considering how regional Filipinos are, a simpler, more Indic method is probably the best way to avoid stepping on people's toes and causing people to sling insults of cultural preference over another. Simplicity, not complexity should be the key. Is kulitan a type of baybayin? A type of baybayin? Yes. "Baybáyin" is a umbrella term used in linguistics to categorize all Philippine abugida writing systems. But it is not a version of the Tagalog baybayin script, no. It is a separate writing system on it's own. The old Kulitan (pamagkulit) is the Kapangpangan offshoot of baybáyin. They both branched out from a proto-baybayin script that developed from the mix of devanagari and kawi scripts. The old kulitan closely resembles the Tagalog baybáyin script, however the modern kulitan today evolved and improved in the recent century to adapt more into the indigenous Kapampangan language's orthography & style that it is now no longer mutually intelligible nor similar looking.